There's not much to add to Friday morning's post here really, other than we have since had a V retracement and shaken out some weak longs, so I thought I'd do something different this morning and show you what I was doing intraday on Friday, as the pattern setup was a lovely example that I'm planning to use in a book I'm (slowly) putting together. As I've mentioned before, I'm on the team of the Princeton Trader trading room, led by Mike Vacchi, and we primarily trade ES intraday there, though we also trade oil, gold, bonds and a few other things on a smaller scale. I've stripped down the chat from Friday's session as far as I can, though it's still longer than I was hoping for, and will show it below interspersed with charts I posted intraday to show the evolving setup over the day. This stripped version understates the contribution of other team members in the room, but it needs to as I want to show the very nice evolving pattern setup over the day, and even this stripped down version is rather long. The people commenting are chappell_charts (myself), Mike Vacchi, eubie (Stephen Eubanks of MarketTalk with Eubie), other PT trading team members Tony Rago and Todd Robetoy, and assorted room members. 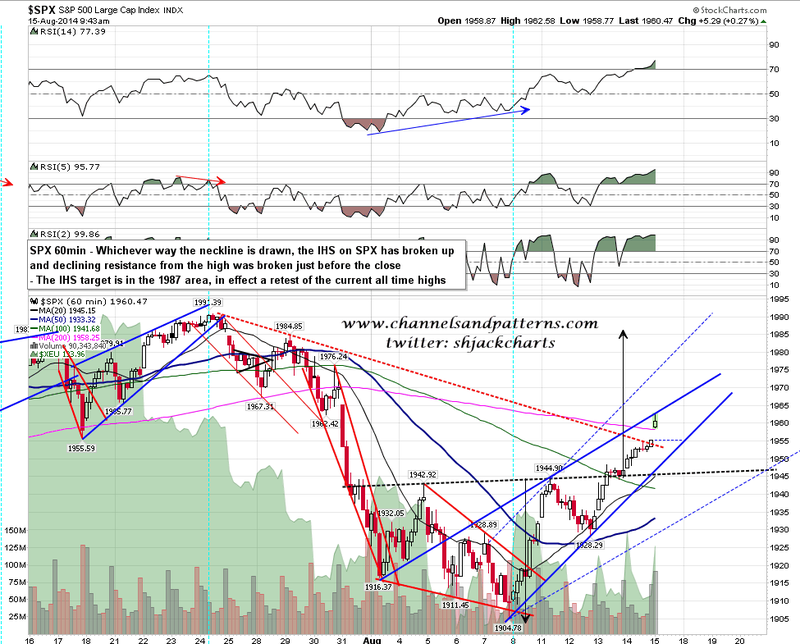 Any of you guys notice a possible rising wedge resistance trendline on the SPX chart I used in my post this morning? michael_vacchi (10:51:34 AM): Headline Minefield = deals with Europe news primarily, a rumor starts regarding X (usually on Twitter), price move in one direction on the rumor, the rumor is usually made by someone with no real authority, then the rumor is denied causing price to reverse violently then steadily and gets back to where price was before the initial rumor. 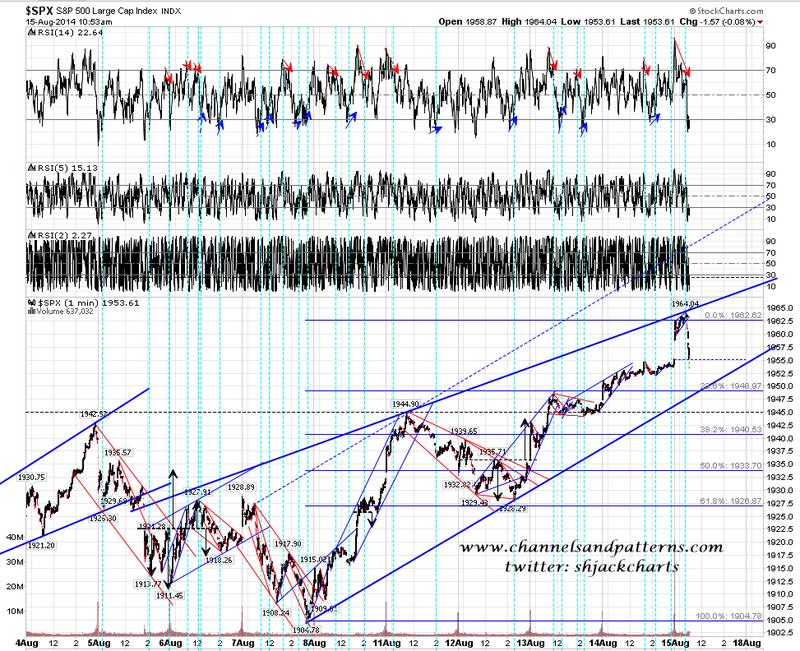 chappell_charts (11:46:25 AM): Updated version of the SPX 60min chart I used in my post this morning: http://screencast.com/t/MCIrckeoUcFw - We could reverse back up here, very bullish, wedge breaks up with target 2015-20 area, or continue to 38.2% or 50% fib retrace. binu_j (12:04:31 PM): where is that at? chappell_charts (12:05:00 PM): 7 points lower binu - so 1930 Es approx. david_k (03:51:42 PM): mv...does that mean we may not see 38 again for a while? david_k (03:56:59 PM): jack...you are thinking this will change in the future? I could have traded the day better. I took +13.25 ES on the way down, and that should have been at least ten higher. I took +7.75 on the way up, with some bad luck being bottom ticked out of my 40 long on the retrace, and left a long on from 1945 that is up +19 at the time of writing. Very nice day overall. What's the takeaway here? 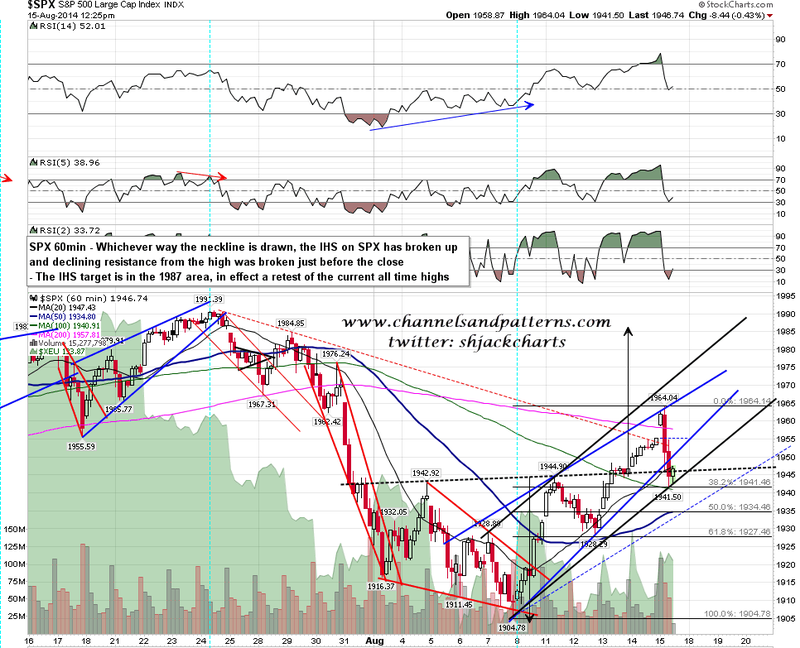 Well equities needed a retrace and got one. 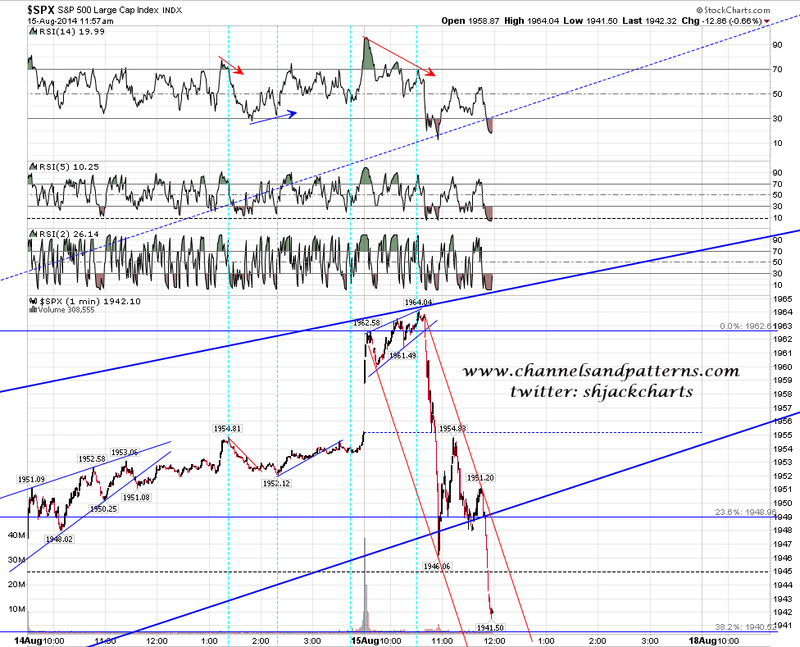 No technical damage was done and we have a new support level at Friday's low. 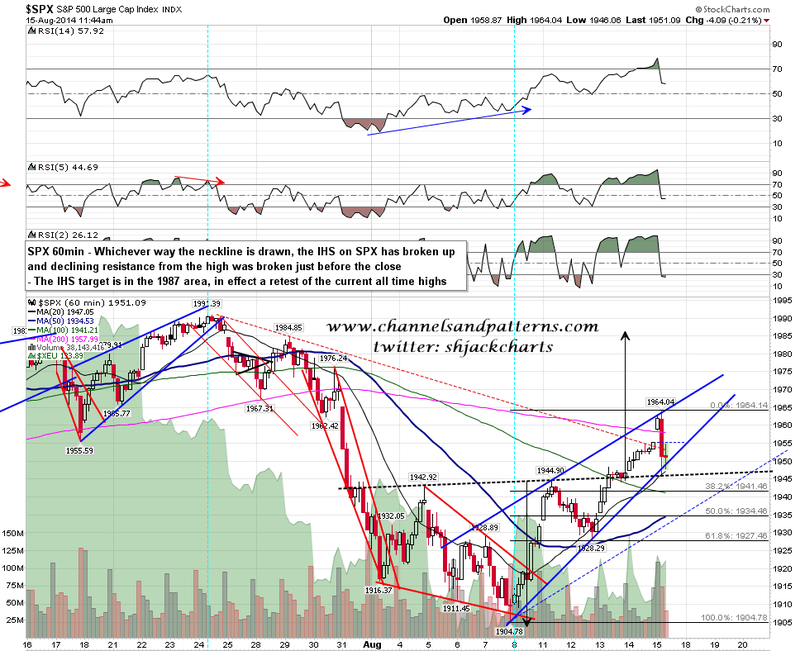 Am I still looking for a retest of the SPX highs? Yes, though as with Friday morning, I'm still looking for a decent break and daily close over the SPX 50 DMA at 1957, and a break below Friday's low at 1941.50 SPX would now be a significant warning signal that the bears might be recovering control of this market. If anyone's interesting in seeing the Princeton Trader trading room in action, free trials are available, and I have a feeling that the next two months or so may well be the most interesting trading months of this year. 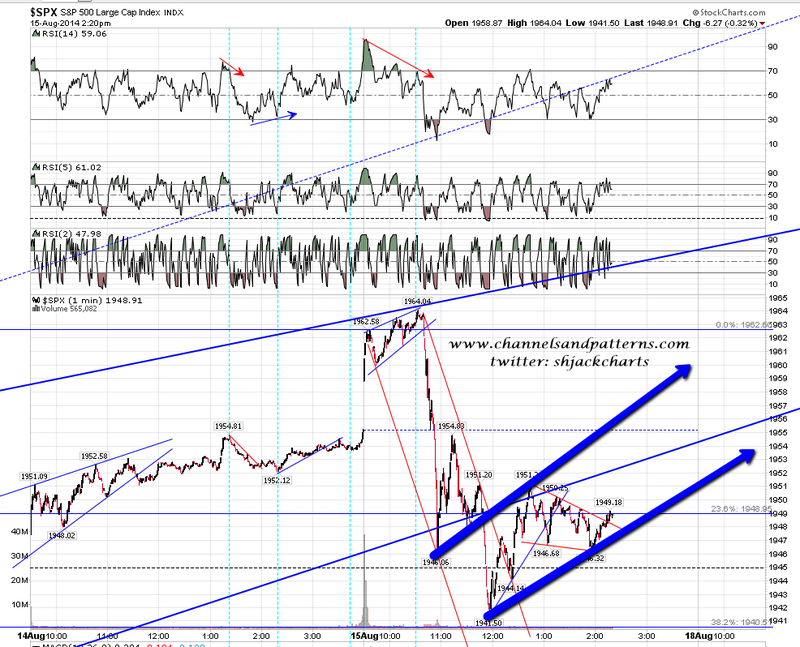 For today I think a full gap fill looks like a long shot, though if we get more war rumors who can say? As long as the Friday low holds we should now have started the move that will take SPX to the IHS target at 1987 and the retest of the highs that I have been looking for since the recent lows.